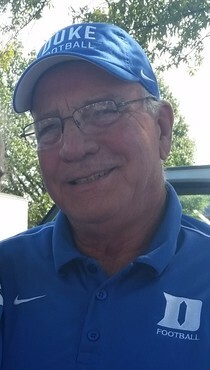 Ronnie H. Bissette, better known as “Ronnie Duke”, formerly of Elm City, NC, passed away Tuesday, February 5, 2019. Ronnie passed away at the Hock Family Pavilion, in Durham, near his home in Roxboro, NC. There will be a private, family memorial gathering on Saturday, February 9. Ronnie was a member of the Elm City HS Class of 1969. He then earned a Bachelor’s degree in Mathematics from Atlantic Christian College in 1974. After a career in sales, Ronnie retired in Roxboro, as Vice President of N.C. & VA. Warranty, Inc. Ronnie valued work. When work was over, he enjoyed spending time in his yard. Most of all, Ronnie cherished spending time with his family and friends. Ronnie had a gift for caring and relating to people that created friendships wherever he went. He was an athlete in his youth and loved playing softball and golf. He was given the nickname “Ronnie Duke”, for being the most long-standing tailgater on “Blue Devil Alley”, for Duke football games. That was his favorite place to be on a Saturday, in the Fall. Surviving are his fiancée, Rebecca “Becky” Lea; sons, Bryan [Kimberly] and Philip [Harley]; daughter Brooke Farmer [Mark Jr.], all of Wilson; Rebecca’s daughter, Christi Osborne [Todd]; brothers, Billy [Esther], Geral [Helen], also of Wilson; twin sister, Connie Lyon [Fleming] of Durham; sister –in-law Jean Bissette of Wilson; six grandchildren, Hailey, Emma, Elena, Brynn, Riley, and Kassidy; and his beloved dog Biscuit. He was preceded in death by his parents, Zackariah “ZR” and Ethel Strickland Bissette; a brother, Royce; wife Gina; and stepson, Michael Manzi. In lieu of flowers, gifts may be made to the V Foundation for Cancer Research, “In Memory of Ronnie Bissette”, 14600 Weston Parkway, Cary, NC 27513 or www.jimmyv.org ; Duke Hospice “ In Memory of Ronnie Bissette” 4023 North Roxboro Road Durham, NC 27704 ; or a Charity of One’s Choice. Harrelson Funeral Services of Yanceyville, NC is privileged to be serving the Bissette family.